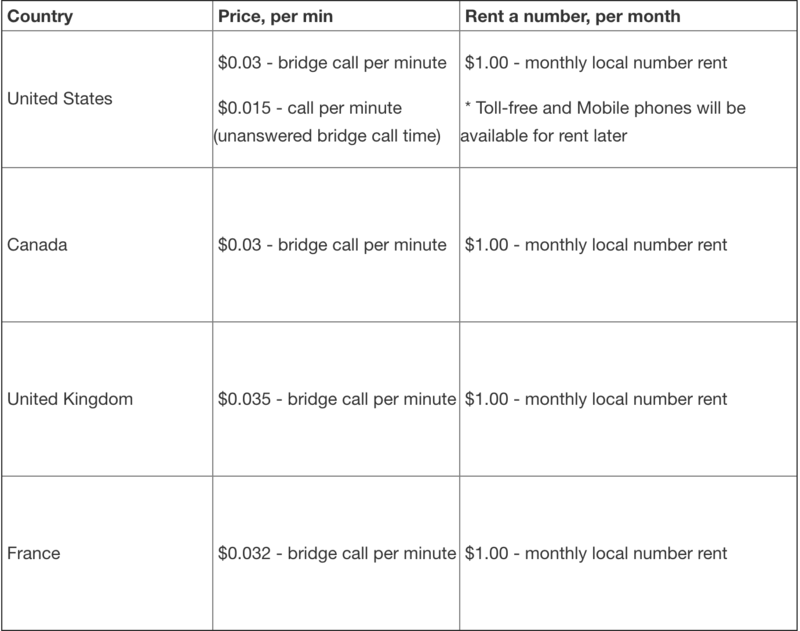 Learn what's the pricing for Bridge/Direct calls and what are the rates for your country. Our Calls functionality is rated per minute and its pricing is based on what location you are calling from and to. The information below will help you to learn how these costs are calculated. In order to leverage dialing, you need to rent the phone number within Reply to call out through, which allows you to perform a connection via the bridge call. To access Calls, voice feature should be enabled for the account. To rent a phone number and use the related calling functionality please request it in Setting - Tools section. Reply uses Twilio as our voice provider. Usage is billed instantly from your Wallet. Phone numbers are billed separately from minutes used (instantly at the same time when a number rent has been processed for the first month). Changes will be processed through our standard billing system. When a phone call is initiated by a click-to-call action, there are two 'legs' of a phone call taking place. Each phone call 'leg' has its cost associated with it. Below are some examples of the pricing for most common countries. For more countries or additional details please contact our support via Live Chat or email to [email protected]. To access pricing for more international calls you can access this Pricing Document.